Order digital prints on Kodak Royal Paper® from the convenience of your home or office. Download our FREE PhotoCenter Home program onto your Windows computer. Choose Matte or Glossy finish in all popular print sizes from wallets to 12x18 posters. 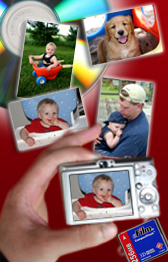 Photo Greeting Cards are available for many occasions including Thank you cards and Holiday Greetings. When you download our FREE PhotoCenter Home program for Windows, you will find many handy features. Use it to organize your photos, fix red-eye, crop out distracting backgrounds, convert color to B&W or old-fashioned Sepia Tone, and print your digital photos at home or at The Camera Shop. You can transmit your order directly over the internet, or save your order onto CD or Memory Card and bring it to The Camera Shop for printing. Download and install PhotoCenter Home.